On the Way to Cape May…you know you love this famous song (originally sung by Cozy Morley)..it gets you in the mood to go to the shore. What’s not to love about this quaint Victorian seaside town? The shopping, the food, the gorgeous nature and wildlife make this a top seaside destination. There are about 4000 year-round residents, but in the summer months, the number climbs to 40,000! One of my favorite places in on the way into CM is a little strip of shops on Sunset Blvd where the Butterfly Tea Room is located. A pal and I found this place one day while bopping around town and wanted some lunch, the colorful and whimsical stores grabbed out attention and we wandered in. Fresh fare, delicious teas in a teapot you pick out yourself from the many around the room, cold soups, finger sandwiches, scones and delightful desserts make the Butterfly Tea Room a place I make a point to visit every summer. Right next-door is Cape May Wicker, a great place for all things summer. Don’t miss this Saturday, June 19, for the Cape May Harborfest, a celebration of the sun, the sea, and seafood! Cape May is also home to film and music festivals. Also check out Sunset Beach where the ‘Concrete Ship’ is beached a bit off the shoreline. This is a prime place to catch a gorgeous sunset. Sunset beach, also known as ‘diamond beach,’ because of the clear quartz rocks that wash up on shore from the Delaware River. Whale watching, dolphin watching is also a prime sport in this area, where dolphins and whales are spotted quite often. Check it out on several tours with the Cape May Whale Watcher. Then change it up a little with the Cape May Haunted Tour. Also check out Elaine’s Dinner Theatre- ghost tours, a haunted mansion and Victorian Inn. Check out the 235-acre Cape May Point State Park, where you can see the still-in-use-today 157-foot-high Cape May Lighthouse. This place is famous for it’s hundreds of species of birds, and some say it is the top bird-watching site in the Northeastern United States. The shopping in downtown Cape May, the boardwalk and Washington Street Mall has just about everything you’d need. Check out the apparel, housewares, foodstuffs and plenty of places to shop. And my personal faves, the local wineries: Hawk Haven Vineyard and Winery, Turdo Vineyards, Natali Vineyards and Cape May Winery. 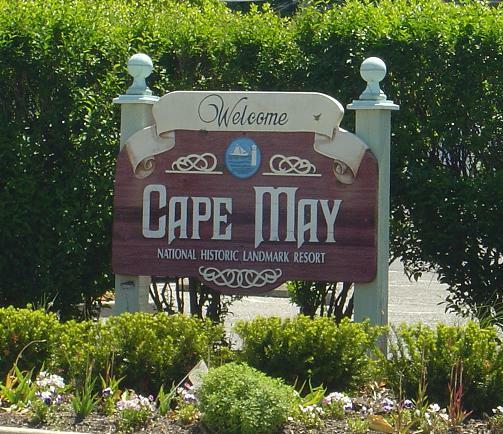 You can also catch the Cape May-Lewes Ferry across the Delaware Bay to Lewes, Delaware and take in the Delaware outlets. So get yourself on the way to Cape May, and relax! Christine Tarlecki can be found on FaceBook under her name and on Twitter under engchik.